Recently the oldest member of the International Society for Krishna Consciousness, Raghava Caitanya dasa, passed away at age ninety-three. Raghava Caitanya was born Mulchand Deomal in December of 1886, at Shikarpur, in present-day Pakistan. For thirty-three years he worked in the British government service, in the executive force of the Karachi police department. At his retirement in 1942, he held the rank of Inspector of Police. Raghava Caitanya dasa first came in touch with Gaudiya Vaisnavism (Krsna Consciousness) in 1905. In that year he read and was deeply affected by Vrndavana dasa Thakura’s Caitanya Bhagavata, which describes the life and teachings of Sri Caitanya Mahaprabhu, Krsna’s incarnation as a pure devotee. Raghava Caitanya became an avid student of Krsna consciousness and also published numerous magazine articles on the subject. In 1970 he first met His Divine Grace A.C. Bhaktivedanta Swami Prabhupada in Surat, India, and immediately accepted Srila Prabhupada as his guru. He was the first person in India to become a life member of the International Society for Krishna Consciousness. And a few years later, at age eighty-nine, he left home to spend his last years in the spiritual atmosphere of Hare Krishna Land in Bombay. In 1977 he fulfilled a long-cherished desire by taking spiritual initiation from Srila Prabhupada. Although Raghava Caitanya’s body was deeply afflicted with arthritis and hardening of the arteries, his mind always remained sharp. 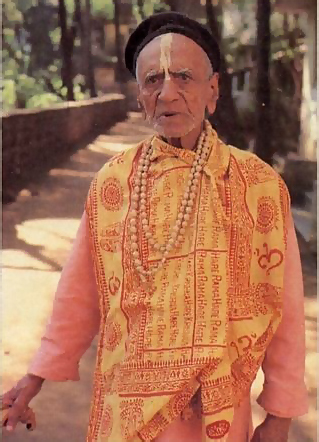 He was like a kindly grandfather to the devotees at Hare Krishna Land, always ready to offer wisdom and good advice and always encouraging us to depend on Lord Krsna and Srila Prabhupada.